Stateless or belonging to Taiwan or PRC? Nationality and passport of overseas Chinese. In Tan Chee-Beng (ed.) Routledge Handbook of the Chinese Diaspora, pp. 310-322. Routledge. Statelessness in Japan: Management and Challenges. In Chai Podhisita and Kerry Richter (eds.) Journal of Population and Social Studies Volume 21 Number 1 July 2012, pp. 70-81. Thai Association of the Population and Social Researchers. Human Rights and Support for Stateless People around the World: Japan's Role, MINPAKU Anthropology Newsletter 32 June 2011, pp15-16.National Museum of Ethnology. "Asian Diasporic Fashion Design and 'Rainbow Metaphor'a case from Yokohama Chinatown", The Third International Conference on Culturewear and the Diaspora Museum, New York, November 11 and 12. "Where I Belong? Memory and Trace of Chinese Migrants", Panel chaired by Blai Guarné and Thomas H. Chivens, Ethnographic Traces: Writing, Routes, and Reflexivity, American Anthropological Association, Montreal, November 20. The Increasing Presence of Chinese Migrants in Japan. Transnational Migration in East Asia  Japan in a Comparative Focus. Senri Ethnological Reports 77: 39–52. National Museum of Ethnology. Stateless Overseas Chinese: Nationality and Identity of Overseas Chinese in Japan. In Chang Qi-xiong (ed.) The Identity of Overseas Chinese under Great Transformations, pp.53–70. Taiwan: The Society of Overseas Chinese Studies, R.O.C. Chinese in Japan. In M. Ember, C. R. Ember and I. Skoggard (eds.) Encyclopedia of Diasporas  Immigrant and Refugee Cultures around the World, pp.680–687. New York: Klumer Academic / Plenum Publishers. Reconsiderig Nationality with Anne Frank. Minpaku Anthropology Newsletter 19: 7–9. National Museum of Ethnology. Statelessness and Boundaries in Japan. In N. Graburn (ed.) Japan: Crossing the Boundaries Within. (Forthcoming, paper submitted to University of California, Berkeley in May 2002). Minorities of Chinese Diaspora in Japan: The Gap between Legal Status and Identities. The Center for the study of the Chinese Southern Diaspora (ed.) Migrating Identities and Ethnic Minorities in Chinese Diaspora. (Forthcoming, paper submitted to the Australian National University in March 2002). The Image and Reality of Overseas Ethnic Chinese Entrepreneurs, Rainbow Networks and Identities. In Tsun-Wu Chang and Shi-Yeoung Tang (eds.) Ethnic Chinese Abroad, Volume I: Migration, Entrepreneurs and Commerce, pp.361–386. Taiwan: Overseas Chinese Association. The Image and Reality of Overseas Ethnic Chinese Entrepreneurs: Rainbow Networks and Identities. Proceeding III: The 4th International Chinese Overseas Conference, Taiwan, 2001, pp.409–432. Business Networks and Ethnic Identities of Chinese Entrepreneurs. Ethnic Chinese at Turn of the Centuries, China: Fujian renmin chu ban she, pp.92–121. "What Does Nationality Mean To Us? Families with multiple nationalities between US and Japan", Panel chaired by Ayako Takamori and Shinji Yamashita, Invited Session: Hybridity in Transnational Japan: Beyond the Multi-ethnic Frame, American Anthropological Association, San Francisco, November 15. “Where I Belong? Memory and Trace of Chinese Migrants”, Panel chaired by Blai Guarné and Thomas H. Chivens, Ethnographic Traces: Writing, Routes, and Reflexivity, American Anthropological Association, Montreal, November 20. “Asian Diasporic Fashion Design and ‘Rainbow Metaphor’ a case from Yokohama Chinatown”, The Third International Conference on Culturewear and the Diaspora Museum, New York, November 11 and 12. “Internationalizing Ethnic Chinese Schools: Making Use of Chinese Culture in Japan Today”, American Anthropological Association, New Orleans, November, 18. “Identification and Nationality of Oversas Chinese: the case of Korea and Japan”, The Academy of Korean Studies, September 10. “Stateless in Japan”, Thammasat University, Thailland,March 25. “Nationality and Pasport in Global Era: East Asian Perspective” Academia Sinica, Taiwan, December, 19. “Multiethnic Japan and Foreign Pupils: A Case of Chinese Schools.” The 6th Conference of the International Society of Chinese Overseas, Transition of Intellectual Network in Asia: Language Code, Identity, and Space, 21–23 September, 2007, Beijing University, China. “Increasing Presence of Chinese Migrants in Japan.” Minpaku International Symposium 2007. Transnational Migration in East Asia: Japan in Comparative Fouces, 31 May–1 June, 2007. “Stateless Overseas Chinese Nationality and Identity of Overseas Chinese in Japan.” Conference on the Era Transformation and Overseas Chinese State Identity, December 2003, The Society of Overseas Chinese Studies, Taipei. “The Rainbow Patterns and Chinese Multi-identities.” The Third International Convention of Asia Scholars chaired by Liu Hong: The Globalization of Chinese Migration: Historical and Comparative Perspectives, August 2003, Singapore. “The Meaning of Border for Chinese Diaspora: The Case of Yokohama Chinatown.” A Study of Border-Crossing and Border-Formation for Chinese Diaspora, Association for Asian Studies 55th Annual Meeting. Panel chaird by Daphne Pi-Wei Lei: Why don’t You Live in Chinatown?, March 2003, New York, USA. “Rainbow Metaphor.” The Third Reseat Conference of Kanto District of The Japanese Society of Ethnology, February 2003, Yokohama. “Meaning of Border and Identity for Chinese in Sabah.” Workshop of Culture and Development in and Around Sabah, organized by Sabah Research Project, January 2003, Research Institute for Languages and Cultures of Asia and Africa. “About the New Methodology of Overseas Chinese Studies.”, December 2002, Aichi University. “The Network and Identities of Overseas Chinese: The Limitation and Vulnerability of Overseas Chinese Networks.” Sixth Annual Asian Studies Conference Japan, panel chaired by Zeng Ying: Entering the Era of Globalization: Migration, Identity and Social Networks among Chinese Communities, June 2002, Sophia University, Tokyo, Japan. “The Globalization of Chinese Business and Identities.” Surfing the Interfaces of Market, Society and the State, March 2002, National University of Singapore, Singapore. “Statelessness and Boundaries in Japan.” Centennial Conference: Japan: Crossing the Boundaries Within, March 2002, University of California Berkeley, USA. “Minorities of Chinese Diaspora in Japan: The Gap between Legal Status and Identities.” Migrating Identities and Ethnic Minorities in Chinese Diaspora, September 2001, The Center for the Study of the Chinese Southern Diaspora, the Australia National University, Canberra, Australia. 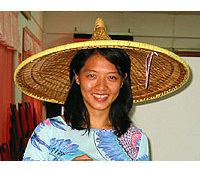 “Transition of Yokohama’s Chinatown.” The 4th International Conference: Chinese over the Seas, June 2001, Havana, Cuba. “The Image and Reality of Overseas Ethnic Chinese Entrepreneurs: Rainbow Networks and Identities.” The 4th International Chinese Overseas Conference, April 2001, Academia Sinica, Taiwan, Taipei. “To Be or Not to Be Japanese: The Legal Treatment of Overseas Chinese and Stateless in Japan.” Annual Meeting of the Association of Asian Studies, chaired by Shizuko Suenaga: Inbound, Outbound, Homeward Bound: Empowerment, Acculturation, and Resistance among Women Migrants, March 2000, San Diego, USA. “Networks and Identities of Overseas Chinese.” Asian Studies on the Pacific Coast Conference: Asia in the 21st Century, chaired by Bernard Wong: Globalization and Issues of Modernity in Asia: Racism, Gender and Nationalism, June 1999, University of San Diego, San Diego, USA. “Chinese Diaspora?The Rainbow Style Networks and Identities.”, May 1999, Fairbank Center, Harvard University, MA, USA. “Overseas Chinese in Japan: Transitions of Community and Identities in Yokohama Chinatown.” Harvard East Asian Studies Graduate Student Conference on East Asia, chaired by Andrew Gordon: Identity Formation in Minority Culture, February 1999, Harvard University, MA, USA. “Nationality and Identities? The Case in Japan.” Asian Center Week Panel Discussion, chaired by Philip Kuhn: Asian Migration, March 1998, Harvard University, MA, USA. “Business Network and Ethnic Identities of Overseas Chinese Entrepreneurs.” International Conference on the Ethnic Chinese, History and Prospective: Ethnic Chinese at Turn of Centuries. November 1996, Xiamen University, Fujian, China.